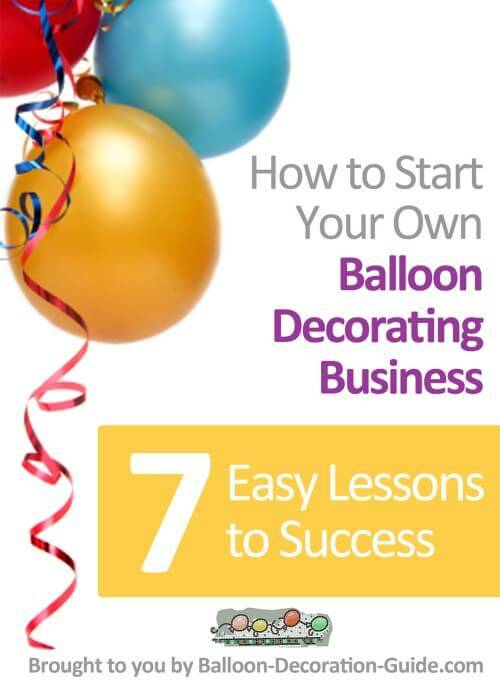 "Seven Lessons to Kick Start Your Balloon Decorating Business"
Wouldn't you love to get all there is to know for a smooth balloon business start in ONE PLACE? And have it delivered to your (virtual) doorstep? But it had to be in "plain" English, no Harvard Business School fancy theory stuff please. You want to be able to APPLY it, within a few weeks, with a minimum of resources and risk involved. Hmm, sounds good so far, but what exactly do you get? With our tried and tested balloon business start eCourse, you'll get ...peace of mind. How? You'll find out if starting a balloon decorating business is right for YOU. You'll find out if there is a big enough market for balloon decorations in your area. You'll learn about the legal and tax obligations that come with your business. You'll discover powerful, state-of-the-art marketing strategies, including social media marketing and pay-per-click advertising. You'll know what tools & materials are essential and where to get them. You'll understand how to build and use your most important sales instrument. Best of all, you will minimize the risk of losing time and money, because you've considered all important facts and because you are in control of every single step to take. In short, you'll be fully equipped for getting your first PAID balloon decoration job, and the second, and the third, and before you know it, you'll be a business owner with a steady stream of income. The 7 Lessons are great. I started my own home-based business last year, just providing Twisting. However, after reading the 7 lessons, I know I will have to go back to the basics, and the drawing board, and basically "redo" some things. Thank you for providing the great resource, and for helping other people. I'm a business owner and have read several articles on starting your own business. I found your eCourse to be very informative. I thought that you put the pricing aspect of balloon decor in easy to understand terms. The seven lessons are a great resource - even if it is not a balloon business you are starting! The tips section is a great reference tool packed with, well, tips! This class has given me insight and ideas to move my balloon twisting to a new level - to make it more profitable for me and for those I train to do balloons - and profitable does not necessarily mean more money. Don’t get me wrong, the money is nice - even necessary sometime ... but nothing takes the place of the wide-eyed wonder of a child when they get a balloon from a grand-parent and the satisfied look on a grand-parents face when they have made something their grand- children want. Click the "Order" button and enter your payment details (we are using Paypal to ensure highest security level for your payment). You will be redirected to a sign-up form, where you fill in your name and - very important - a working email address. Within minutes, you will receive the first two eCourse lessons. They come in .pdf format, so you can either read them online or print them out. Altogether you will receive 7 information packed lessons in 4 weekly installments. Sign up for the balloon business start eCourse absolutely risk-free. If it isn't up to your standards, for any reason, at any time, just send me an email. I'll refund you immediately. That's more than a guarantee. It's a personal promise! P.S. Just to be clear: this is NOT a balloon decorating course, although you'll get insider tips for the best learning resources. It is a business building course tailored to the specific needs of balloon decorators.